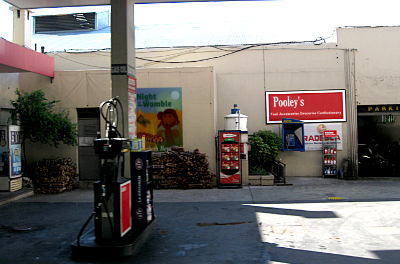 All too often these days the purchase of fuel and associated motoring paraphernalia is accompanied by a surly disregard for the comfort and wellbeing of the purchaser, usually delivered by some callow and pimpled youth with little understanding of the value of a really good de-icer or a superior screen wash. That's not the case at Pooley's, where the staff are fully trained in as wide a range of motoring products as you'll find anywhere this side of Taunton Deane. And I do mean fully trained. Want to know which air freshener will best complement the slightly worn leather interior of a 2013 Mk V Ford Mondeo? These are the guys to ask. I was fortunate enough to spend some time talking to owner Mike Pooley, an easy-going chap with some refreshing ideas about non-standard headlight modifications. He told me that quality customer service has always formed the bedrock of his operations. "If customers don't drive off our forecourt happier and more fulfilled than when they arrived," he told me, "then we very much feel that we've failed in our duty." And it is a duty. A very real one. Mike was also very keen for me to mention the special two-for-one offer that they are currently running on Turtle Wax, and with top deals like that it's hard to see how they could possibly fail to provide satisfaction. But don't imagine that their attention to detail is limited to the motorist's trusty steed (car); they also provide fodder enough for the rider (driver). What I'm trying to say is that they also do a full range of snacks and pies. In fact, they have just about everything you could possibly imagine to assist the weary traveller on his way. Their sandwich range is extensive, encompassing old favourites such as cheese and ham as well as more exotic fare such as egg and cress or chicken tikka, all of which are within their sell-by date. Their range of cold drinks, likewise, leaves little to be desired: they stock both Coke and Pepsi, as well as a more reasonably priced budget alternative. This article was sponsored by Pooley's Service Station and Convenience Store. Call now for great deals on antifreeze.